Gunmen kill 8 in Tripoli hotel attack. Gunmen stormed a luxury hotel in Libya's capital Tuesday, killing at least five foreigners and three guards, authorities said. The attack, which included a car bombing, struck the Corinthia Hotel, which sits along the Mediterranean Sea. Mahmoud Hamza, commander of the so-called Special Deterrent Force, told private satellite television station al-Nabaa that the situation was "under control" Tuesday afternoon, though he couldn't confirm the whereabouts of the gunmen. He also said five foreigners were killed, without elaborating. Another security official earlier said the gunmen killed three guards and took hostages, but had no further information on the captives' identities. He also said that two commercial landmark towers behind the hotel were evacuated out of security concerns. He spoke on condition of anonymity because he was not authorized to speak to reporters. A hotel staffer said the attack began when five masked gunmen wearing bulletproof vests stormed the hotel after security guards at the hotel's gate tried to stop them. He said they entered the hotel and fired randomly at the staff in the lobby. The staffer said the gunmen fired in his direction when he opened his door to look out. He said he joined the rest of the staff and foreign guests fleeing out the hotel's back doors into the parking lot. When they got there, he said a car bomb exploded in the parking lot, only a hundred metres away. He said this came after a protection force entered the lobby and opened fire on the attackers. He said two guards were immediately killed. The staffer spoke on condition of anonymity because he feared being targeted later by militants. He said the car bomb left at least five cars in the parking lot burned and damaged some windows in the hotel's facade. He said the hotel had Italian, British and Turkish guests, but the hotel was largely empty at the time of the attack. He said the militia-backed Prime Minister Omar al-Hassi usually resides at the hotel, but was not there Tuesday. Al-Hassi's security guards also weren't there, he said. The hotel previously came under attack in 2013 when a former prime minister was abducted there. Since the ouster and 2011 killing of Libyan dictator Moammar Gadhafi, the country has been torn among competing militias and tribes vying for power. Libya's post-Gadhafi transition has collapsed, with two rival governments and parliaments — each backed by different militias — ruling in the country's eastern and western regions. 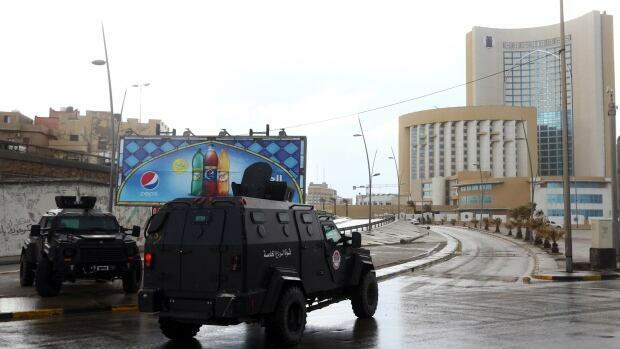 Tripoli has been hit with series of car bombs and shootings amid the turmoil. The Malta-owned hotel is also where the United Nations support mission in Libya holds its meetings. The mission is currently hosting political talks with rival Libyan groups in Geneva.